[ February 12, London, Sri Lanka Guardian] Last night was perhaps the longest night I ever watched the TV, flipping through different channels to witness what was unfolding in Egypt. It re-affirmed that the will for justice and liberty can overcome hunger, chill in the air, and the uncertainty of tomorrow. I was taking notes when CNN interviewed experts in different fields and those at ground zero waving Egyptian flags. I have shown bellow what I could summarize. We know that perceived corruption and digital divide in the system fuels existing public disgust towards a regime. 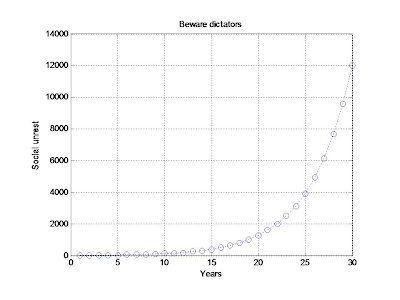 There are so many other factors that exacerbate or iron out these public ripples against a regime. For instance, social networks help to propagate the urge to take action regarding poverty and public disgust felt by a particular segment of a society. On the other hand, very partial state media help a regime to brainwash masses to stay in power. 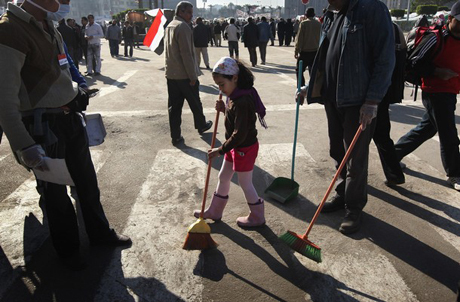 Military strength can also deter mass movements against the regime. Moreover, foreign sponsorships, if properly used can strengthen military while serving some of the social needs, thus contributing to defer a massive public uprising. Blind patriotism also helps many corrupt regimes. It was seen in the last speech of the Egyptian leader where he tried to stir patriotic sentiments among the youth that did they did not quite swallow. Then, these factors were used to formulate a recursive equation for the growth of effective manpower to overthrow a regime. Figure 1 shows the criterion for a recursive equation of this nature to diverge over time. 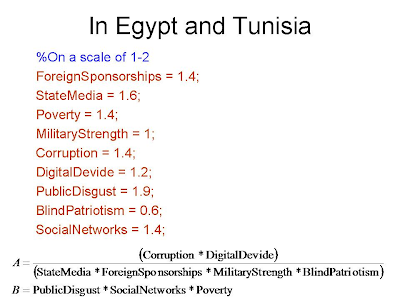 Based on what I heard through interviews conducted by several media organizations with infrastructure to connect people from various parts of the world, and based on my own experiences during a short visit to Cairo in 2008, I assigned values between 1-2 for each of the above factors as shown in figure 2. 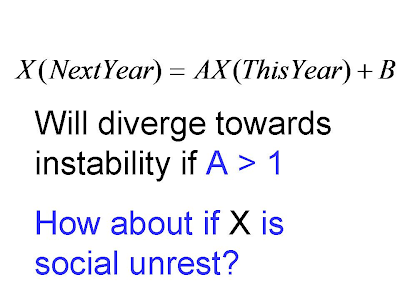 Figure 3: Development of social unrest over years. I know it is a bad habit to watch TV while working on the lap top computer. But it helped me this time. Few lines of coding could generate the graph shown in figure 3. Here, I make the assumption that the above values of all factors persisted over the last 30 years. It may not be the case. However, this simple linear recursive equation explains what went wrong in Egypt over the last few years, and likely to repeat in other parts of the World at some point. I am not a sociologist. I spent less than two hours to do this out of my own interest and energy given by the people of Egypt. However, all engineers like me want to understand complex phenomena using simple dynamical equations as much as possible. Interestingly, many complex natural phenomena like growth of bacteria colonies, spread of rumors and deceases, and economic recessions can be explained using simple recursive equations. Therefore, I would love to collaborate with an expert in sociology to further develop this model that might help policy makers to predict recursive development of public opinions based on on-going surveys for above factors that went into the equation.